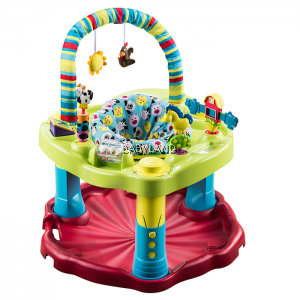 Evenflo partnered with the Child Development Institute, to develop ExerSaucer activities that engage a baby's senses, spark imagination and encourage interaction. For over twenty years, ExerSaucer activity centers have helped children develop their gross motor skills, fine motor skills, object exploration, cause/effect learning, self-awareness, tactile development, visual development, object permanence, and hand-eye coordination. Give your baby an ExersAwesome head start. Maturity: Discontinue use if the child can walk, stand flat-footed in the ExerSaucer in the highest adjustment level or climb out of the product.